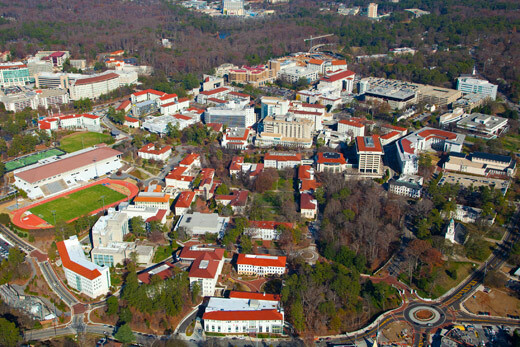 An aerial view of Emory University in Atlanta. Emory University has been ranked 20th among the nation's top universities in the new 2013 Best Colleges guidebook from U.S. News & World Report. Emory also was listed as 18th among national universities offering the "best value" to students based on a combination of academic quality and the average level of need-based financial aid. Emory's Goizueta Business School, which is ranked separately from the university's main undergraduate program based on a peer survey of deans and senior faculty, came in 14th in the undergraduate business rankings. "An education at Emory University is the sum total of many distinguished components that are difficult to aggregate and rank in one numerical grade," says Emory Provost Earl Lewis. "As a research-intensive university, Emory offers undergraduates unsurpassed opportunities to study from professors in a wide range of disciplines, and to perform research and undertake original scholarship in many different settings," says Lewis. "Whatever 'marks' we might be assigned by others, Emory by any measure is one of the world's leading centers of discovery and learning." "We enjoy a unique combination of people, resources and partnerships, located within the context of metropolitan Atlanta, one of America's most diverse and vital cities," he adds. Emory's rankings this year are based on corrected admissions data for the entering freshman class in 2011. Emory announced in August that the university's new dean of admission had discovered discrepancies in previous years' data that were submitted to U.S. News & World Report and other standard college guides and reference sources. The university supplied corrected data to U.S. News & World Report that were used in this year’s computation. For full background information see www.emory.edu/datareview. The new 2013 rankings appear today at www.usnews.com.